BAGHDAD, Iraq (CNN) -- Members of an Iranian group designated a terrorist organization by the United States and Iran say Iraqi forces attacked their camp Tuesday evening, killing at least four unarmed people and injuring about 385. 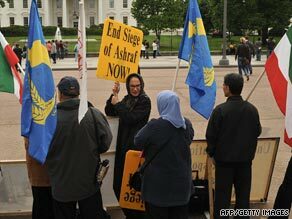 Supporters of People's Mujahedeen Organization of Iran protest in front of the White House in May. However, an official with Iraq's Interior Ministry said only 15 people were wounded by national police during a raid led by security forces at Camp Ashraf on orders from the government to take control of the city. The official said residents were beaten with batons, but did not confirm any fatalities at the camp -- home to the People's Mujahedeen Organization of Iran. The crackdown at the camp fell on the same day that Defense Secretary Robert Gates made a surprise visit to Iraq. A police official in nearby Baquba said the "operation is still ongoing. We do not have a final report of what happened." The official said more details would be released Wednesday. About 3,500 people live at Camp Ashraf, most of them members of the People's Mujahedeen for some 25 years after fleeing Iran. Iraq and Canada also consider the People's Mujahedeen a terrorist group, but the European Union and the United Kingdom have dropped that designation. Baghdad officials announced Tuesday that the government would handle security within the camp as part of the transfer of power from the United States to the Iraqis. Government spokesman Ali al-Dabbagh said Baghdad would be committed to the "humanitarian acts" required by international laws, but that government officials would be at the camp to force refugees to leave Iraq. The National Council of Resistance to Iran, an umbrella group of Iranian opposition organizations -- the largest of which is the People's Mujahedeen -- accused the officers of firing pepper gas and beating the refugees while demolishing the walls and fences around the camp. The group called on the United States and the United Nations to intervene on behalf of the refugees. Officers fired on People's Mujahedeen members, killing four, said Shahriar Kia, a resident of and spokesman for Camp Ashraf. Kia said the officers took away nearly 30 residents of the camp to undisclosed locations. People's Mujahedeen video from what the group says is Tuesday's attack shows Iraqi troops cutting through locks at the chain-link gate of the camp as refugees hold up their fists and chant "Allahu akbar" -- or "God is great." Iraqi soldiers are seen striking the residents with batons and hosing them down with what appears to be water as several of the refugees cling to the opened gates, trying to pull them closed. Camp Ashraf, which has housed Iranians since the mid-1980s, was under U.S. protection until January 1, when it was handed over to the Iraqis. Maryam Rajavi, president-elect of the National Council of Resistance to Iran and the long-time leader of the People's Mujahedeen, sent a letter to President Obama asking for help against "a conspiracy hatched by the religious dictatorship ruling Iran against the lives of 3,500 residents of Camp Ashraf." She asked the president to issue an order that would task U.S. forces with protecting the camp. The U.S. military in Iraq could not be reached for comment late Tuesday. Also known as Mujahedeen-e-Khalq, the People's Mujahedeen Organization of Iran was initially formed to oppose the shah of Iran, but fell out of favor with the Islamic Revolution of Ayatollah Ruhollah Khomeini after 1979. PMOI, an Islamist group that promotes a Marxist government for Iran, waged a violent campaign against the fundamentalist Islamic Tehran government -- including bombings that killed politicians, judges and cabinet members -- for years. The group allied with Saddam Hussein in Iraq in the mid-1980s and even fought with the Iraqis against Iran in the latter years of the Iran-Iraq war. The People's Mujahedeen renounced violence in 2001, but a group of 12 former members of the group told Human Rights Watch in 2005 that they were subjected to physical and psychological abuse when they made it known they wanted to leave the organization. The group is also said to have provided Western governments with information about Iran's nuclear program. CNN's Raja Razek and Mohammed Tawfeeq contributed to this report.